I can't believe it's only 4 days left until 2016! 2015 has definitely been a great reading year. I participated in 2 reading challenges this year, Goodreads 2015 Reading Challenge and Popsugar 2015 Reading Challenge. I'm really sure I could finished them all, but well... things happened. So did I finished them? Let's take a look at the details! I did it! For the Goodreads Reading Challenge, I read more than what I expected. I set my goals around 65 books, but I managed to read 72 books.I actually think I read more than 73 books, since I don't add to curently-reading shelves all books I re-read. And I'm currently reading 3 books, so yeah. I guess I did pretty well here. It was less than my last year's goal, but I barely finished last year's challenge, so I'm pretty happy with this year's results! (Phew! That was a lot!) I think I did a pretty good job with this challenge, even though I didn't finished it. I managed to read more books outside my comfort zone (nonfiction, graphic novels) and I actually find myself enjoying them! Did you participated in any reading challenge this year? How does it turn out? Wow, this was such a long list! I'm glad that you were able to complete your reading challenges this year, although you weren't able to finish the other one. I totally understand that, because there are really times when you don't feel like reading this certain book so you opted to read you think you're feeling good about. Congratulations on this, sister! Congratulations on completing your Goodreads challenge! And you did so well with the other one, as well. I saw the one for this year, and I almost contemplated doing it, but I don't like reading books because I have to, so I ultimately decided I wasn't going to do it, haha. I completed both the challenges I set for 2015! I read more than 125 books for the Goodreads Challenge, and I read more than 10 books for the LGBT+ Challenge. I'm so happy :D I hope I can keep it up this year. 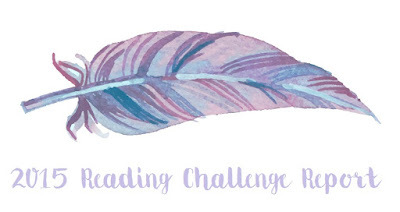 Good luck with your Goodreads Challenge for 2016!